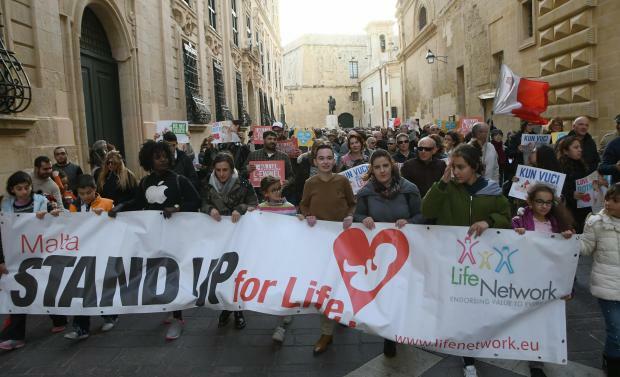 A pro-life manifestation in Valletta. A UK-based charity providing financial assistance, practical information and accommodation to those living in countries with restrictive abortion laws, said on Thursday it has launched its service to residents in Malta and Gibraltar. Those needing its services may call Abortion Support Network helpline, visit the website or send an email and receive confidential, non-judgmental information, the organisation said in a statement. It said it would offer advice on the least expensive way to arrange abortion and travel, clinics that ASN worked with in several EU countries, and, where necessary, financial help towards the cost of travelling from their home country and paying privately to access a safe, legal abortion. Malta has the strictest abortion laws in the world, banning the practice under any circumstances, whereas the law in Gibraltar allows abortion to save a woman’s life. ASN said that in addition to practical and financial support for those travelling, it would also provide funding for people in Malta and Gibraltar who wanted a telephone consultation or counselling session provided by leading UK abortion provider, British Pregnancy Advisory Service. ASN’s founder Mara Clarke said “this Valentine’s Day, ASN is thrilled to spread the abortion-fund love to those living in Malta and Gibraltar. “We have been providing our services to Ireland, Northern Ireland and the Isle of Man for almost 10 years and have an excellent network of donors, volunteers and supporters who believe that ‘I can’t afford an abortion’ should never be the only reason someone becomes a parent." Ms Clarke said outlawing abortion never stopped abortion but made it inconvenient for those with financial and other supports, and catastrophic for the marginalised, at risk, or poor. While ASN hoped that both Malta and Gibraltar would change their laws to enable women and pregnant people to have safe, legal abortions closer to home, it was more than happy to provide practical information, financial assistance, and, where possible, accommodation in volunteer homes to anyone who needs help in the meantime. ASN said it may be contacted on 00356 2668 0990 or email: malta@asn.org.uk.